construction for one of the most prestigious organizations in the USA. 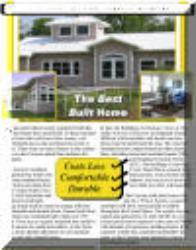 Owners living in All Wall System homes to interview them and review their energy cost bills. the All Wall System solved ALL of the concerns he had been teaching for wood construction. problems, like All Wall System does. the Case Study in PDF format. Back to "All Wall System.com"